I picked up a geerlok, 40p Xgoeny, to help with my training and after I don't know how may attempts and a probably 20kp I didn't go up one level with the geerlok! I had more success but not more skill levels. So I put it away, saved up more plat and went up 3 levels in less than 5kp. I am either the most unlucky halfling around or you can't increase skill levels with it. Yes you skillup with it, even upto 250 when it sets you at 252 for awhile. Just bad rolls you got. bought one last night on bazaar for 25pp the others were in the 100pp+ range. Any other +% Fletching items? Anyone know if there are other +% Fletching items out there? I've seen +% to tailoring, smithing, baking (aside from the Geerlok tools), but as of yet, this is the only +% fletching item I've seen. RE: Any other +% Fletching items? Yes, there is. PoP added another +5% skill mod item which can be held in a few slots (ie you can hold it AND a geerlock). They are no-drop, and are trivial somewhere over 250 skill, but has some nice stat mods for any trade skill (+10 STR/WIS/INT and +50 CHA). Just imagine... 2x that +25 cha stein and this for an extra 100 cha, and switch in a geerlock for the actual fletching... plus, you can get a 10 slot 1.2 wt 100% wt reduction bag as an added bonus! The skill MOD does not stack with the trophy. So if ya get the trophy, sell or give away your geerlok device. Didn't see much of a change in my skill, had about the same amount of failures i normally do, 3 or 4 a stack, but i did have the accasional 0-2. BTW i have 3 of these for sale on cazic, send a tell to atwight if you're interested. Oh and it looks like a dagger when equipped, if anyone cares. one by one the imps steal my sanity. I love these items to help tradeskills. They are starting to get cheap enough to purchase with the Bazaar open now. Its cheaper to buy one of these and then buy INT or WIS items as I can afford them. Wis or Int have nothing to do with the success or a combine. your skill lvl is the only thing that will determine the successful anf failed combines....while Wisor Int will only affect your skill raise. I have a ranger and a gnome, and I made him a fletching tool (after a bunch of tries). It raises by 5% (meaning 100 becomes 105 and 200 becomes 210). I didn;t actauly see my skill change, but I had a fair number of successes (though it could have been luck) at a non-trivail arrow set compared to un-equipt. I sell these for about 500 plat. They are hard to make, but by the supply to demand laws of economics, these won;t be in too much demand. Sure, people fletch out there, but their market is gone for selling THEIR items, except for perhaps a dual camed shaped shadowood bow...which still isn't better then many bows dropped by MOBS, but has a rnage range and dmg/dly. Having seen only a few of the new tinkered items, I think there will be many rich Gnomes running around in the future. I am assuming one will need a new Geerlok Planing Tool after each successful combination. I am anxious to see the results from using this item. RE: Gnomes will be rich. Actually (and I'm not sure so don't hold me to this), the tool will never disappear. 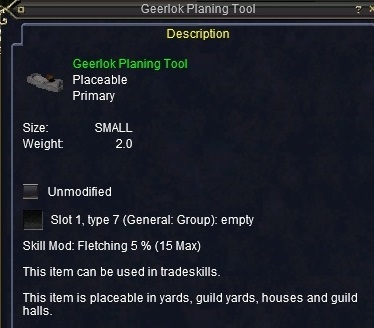 This tool goes in the primary melee slot, regular planing tools go in the fletching kit with the other components. Now, what this could mean is that the price of these items will be relatively high, as you need only purchase one per fletching character. That would be great! I hope it is true. Thank you for the information. You only need to purchase one of these per fletching character. Excellent device, subjectively, the 5% increase in skill seems to lower the number of failures on combines I get, and I still seem to get regular skill-ups. Could one also use it in place of a plane? or is it only used in the pri slot for the bonus, while fletching? This item gives you a 5% boost to your current fletching skill. If your skill is 200, and you're working on an Arrow that trivs at 202, you'll be combining them with a modified skill of 210. You'll still get skill-ups however, just like your skill ws still 200. I was under the impression that the + % skill items give the number as a bonus not as a percentage of your current skill. ie +5% adds 5 to your skill regardless of what it is. 10 skill goes to 15, 200 skill goes to 205.
the way it seems to me is in that u are right it gives a bonus to your current skill level but it says plus 5% not plus 5. A percentage isnt a set number so if your skill is 10 it would add whatever 5 % of 10 is. However that just the way i see it. I had assumed that the 5% bonus was to success. If you have, say a non-trivial item where you would normally only expect to succeed 20% of the time, this would improve it to 25%. Hope I'm right! This is speculation, as I have yet to botain one of these tradeskill enhancers. REEEAALY want the smithing one though! Cool gnomes make this I assume, anyone have the recipe? The recipe for the planing tool is as follows copied directly from www.EQ-Traders.com.